As business people, as individuals, and family members, as human beings, we all know how important relationships are to existence. When it comes to running a website, we can become disconnected with those “eyeballs” that are investigating our offerings. So many fish swimming past your fishing hole. The trouble is, as website operators, you can forget that you have an incredible opportunity to make connections. Simply putting your offering out on a web page, a product, a piece of content, a service, simply is not enough to convince users to continue to interact with you. Simply existing is not enough to build relationships. It is no different than real life. In life, we smile and say hello when we see another person. We complement them and say that we value them by making eye contact, and by engaging them. It is no different than your relationship with your visitors when running a website. But so many website operators are missing this key piece of the puzzle when it comes to their path to success. If, as a website operator, you are not constantly focused on your end-user’s experience, if you’re not putting all of your efforts into how every single person who is coming to your website is EXPERIENCING your offerings, then it is no different than just walking down the street with a sign that says “My name is Joe, and I know stuff about [whatever you’re offering]”. So, are you putting engaging content with visually stunning graphics on your website? Are you providing some content in the form of video? Not everyone looking for your offering will prefer to read your well crafted paragraphs of sales material. Consider recording a video talking about what it is you offer, and connect with them. By 2020, over 80% of the Internet’s traffic will be attributed to video. Why? Well, lots of reasons. But basically, the throughput is now available for people to get streaming video without having to wait for minutes (or hours) to buffer what it is they want to watch. Users are becoming accustomed to viewing movies, tv programs, instructional videos, and reviews, right on their computers, tablets and mobile phones. This is your opportunity to connect to your visitors, to show that you are a real person, and by doing so start to build that relationship. Look them in the eye, and have them experience you — because people do business with people, not with businesses. If you are running a website, and it isn’t set up to respond to different types of devices (desktop vs tablet vs mobile phone) then it will fall farther and farther away from being accessible to those people that need what it is you offer. Search engines are giving priority to websites that have their content ready for mobile devices. As over 50% of website traffic, and over 50% of e-commerce transactions, are now done on mobile devices, you’re going to lose out if your website is not formatted to be responsive for all device times. If you have one of the old-school non-responsive websites, fear not. There are responsive website templates that are available to help you upgrade your website. 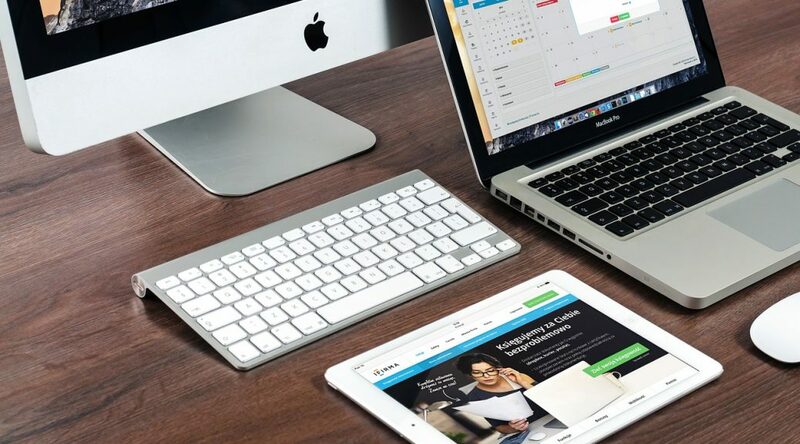 If you’re not one to make those changes yourself, usually the businesses offering this new generation of website design will also have services available to transfer your old website content to the new state-of-the-art mobile responsive designs. If you have engaging content, and a responsive design, then next you should focus on making sure your website is loading fast. It’s pretty obvious that if a website loads too slowly, that you’re going to get people that don’t want to wait around and hit the ‘back button’ on their browser. But what can also happen is that if you have a slow website, your position in the search engine result pages can be in jeopardy. Search engines, especially Google, want to provide results for pages that load fast. So if your site doesn’t load fast, but your competition’s website DOES, where do you think your site will rank? This is incredibly important to consider. Google has a tool to help web developers identify what they have to work on to make their web pages load faster. It’s called Google PageSpeed Insights. Google PSI is a fantastic tool. But it’s just a tool to tell you what you need to do, it doesn’t actually fix anything — that’s up to you. But if you don’t know how to accomplish the tasks that Google PSI suggests, it can be difficult and frustrating to implement. If you do know how to implement their suggestions, then it is just plain time consuming. We’ve been developing a website plugin to take all of Google’s suggestions and implement them automatically to make your web pages load faster. This website plugin is called Accelerator. 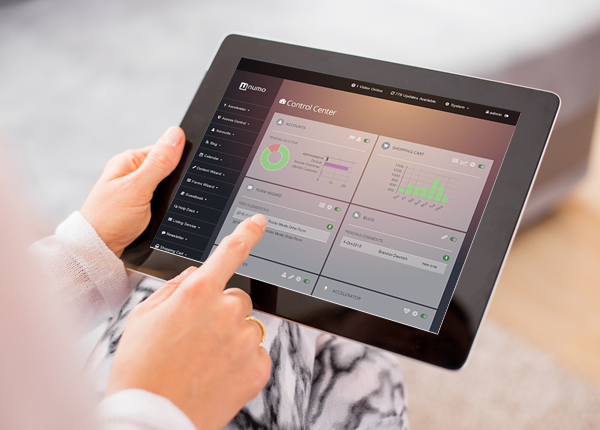 Accelerator tackles this particular User Experience aspect for you, all automatically, saving you valuable time. You can do this. Engage your visitors, make sure your site is mobile responsive, and make sure your website loads fast. Make user experience the primary focus for your website — your interactions, your relationships are your most powerful asset you have, in life, in business, and on the web. In our third week of our mini-checklists designed to help website developers and do-it-yourself website-operators, we are going to focus your visual content: images. Every once in a while, we come across a website that has so perfectly integrated one of our website plugins, that we’re blown away by how seamless it seems. This happened this last week when I happened to be looking at a website put together by Rita Dapkey. Rita has been a long time customer of ours, and recently shared on our Facebook page what the felt of our products and services (hint, she likes them). Every time someone shares that they’ve had a great experience, I always like to go take a look at their websites. And I have to tell you, neshaminyfootball.com is what we believe every high school football team dreams of having as a website. It looks great! It has vibrant images! It uses a responsive design, loads fast and is engaging. 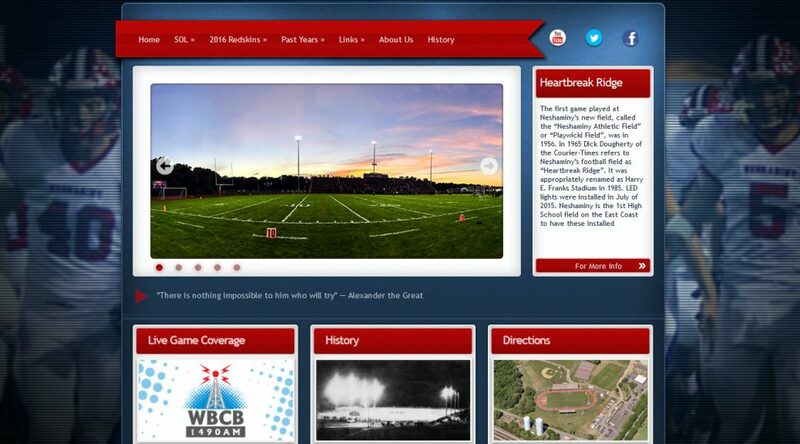 The Neshaminy Redskins website uses one of our Generation 10 responsive designs with a Calendar plugin integrated. I was so impressed with how Rita has set it up so that each different team for the school is displayed using a different color in the Calendar — very effective! So we wanted to take a moment to give a “tip of the hat” to Rita for an excellent job putting together the website and the integration of the calendar website plugin, and to say thank you for the feedback. In our second week of our mini-checklists designed to help website developers and do-it-yourself website-operators, we are going to focus on standard content. If you don’t have a great “About Us” page, why should your visitors deal with you, or purchase your item, or use your service? The “About Us” page should be considered a sales page, telling your visitors what it is that you do for them, and why working with you will make their lives better. Many visitors will not work with a company if there is no way to get in touch with someone. You absolutely must provide a means for contacting you, at the very least a contact from (either on your home page, or on a “Contact Us” page). An email, mailing address, as well as a phone number are all great options. The more ways to contact you, the more your visitors are going to feel confident about dealing with you. Different from a server-default “Page Can Not Be Found” page, you should have a working 404 page which displays a list of optional other pages, in the event that the visitor came to a page that doesn’t exist. If you don’t have one of these pages, it is seen as unprofessional. By using a proper 404 page, you are using an “oops” to turn it into a possible “success” by giving the end user options. Not all websites lend themselves to using a blog. 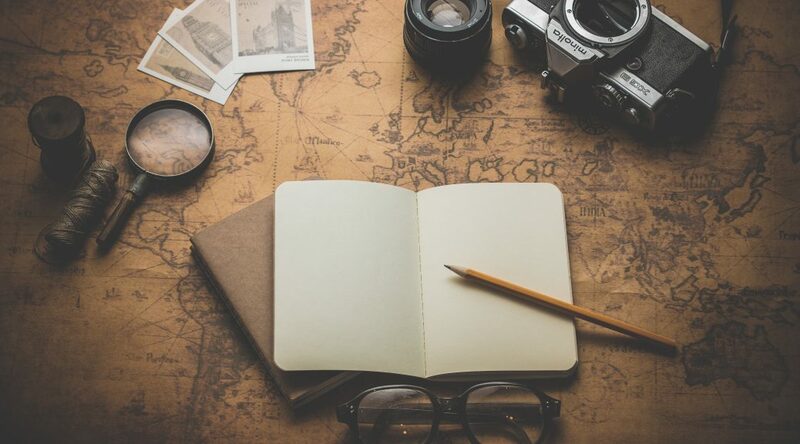 However, if you are into sales, services, or any time of website that may have content that can be shared, it is vitally important that you set up a blog so that you can engage your visitors with helpful information and news on a regular basis. Do not discount having a blog!! Having regular, meaningful content posted to your website, that is then later re-syndicated to your other social media channels, is incredibly important to your success when it comes to engaging your community. Stay tuned for more tips in the coming weeks! Last Friday, during our weekly webcast, we let slip that Numo 2017 is in development and slated for a November launch. 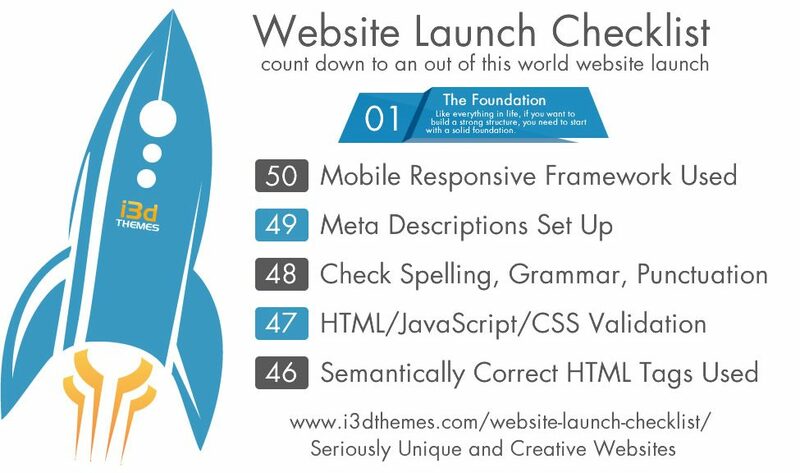 In our first week of our mini-checklists designed to help website developers and do-it-yourself website-operators, we are going to focus on the foundation. Website Launch Checklist — Count Down To Success! 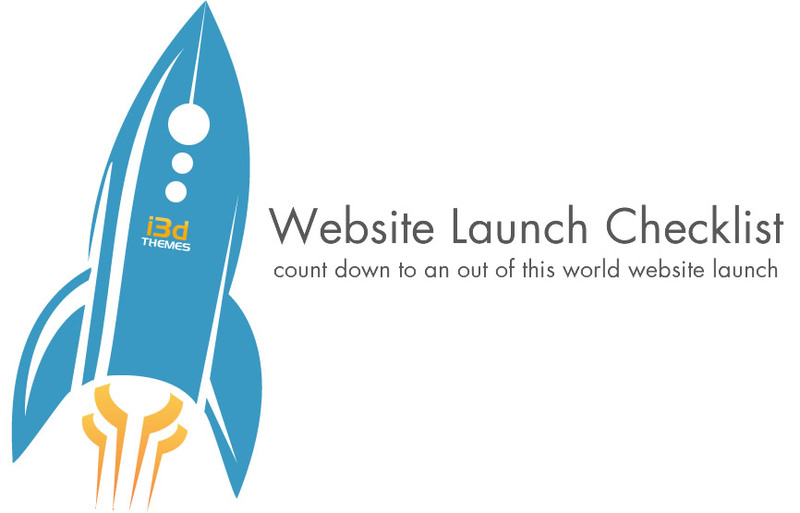 Launching a successful website can seem like a daunting task. But, if you break it down into manageable bite-size tasks, it’s a much easier concept. Wow, have we been busy here in the i3dTHEMES code labs this week! With the launch of Gifted on Wednesday, the continual upgrading of non-mobile friendly client websites to a mobile responsive framework, and the work on two amazing new projects, our focus has really been on User Experience (UX) this last week. We cannot stress enough, you must concern yourself with your visitor’s experience. Does your site load fast, is it responsive, is it engaging — it isn’t JUST about content any longer. In this week’s video, I talk about the projects we’ve been working on that have been focusing on User Experience, and how it can help you. I think he should give himself a huge pat on the back — he did a fantastic job! 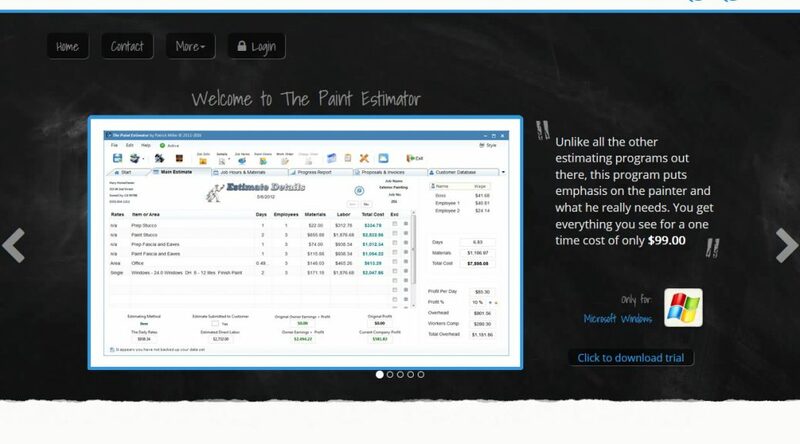 Not only did he use the core elements (slider, testimonials, info boxes) in an extremely effective manner, he also employed the use of the content on his page to really make the home page a compelling sales page. On top of that, everything looks great in mobile view! So we wanted to take a moment to give a “tip of the hat” to Patrick for a job more than well done, and to say thank you for the feedback.